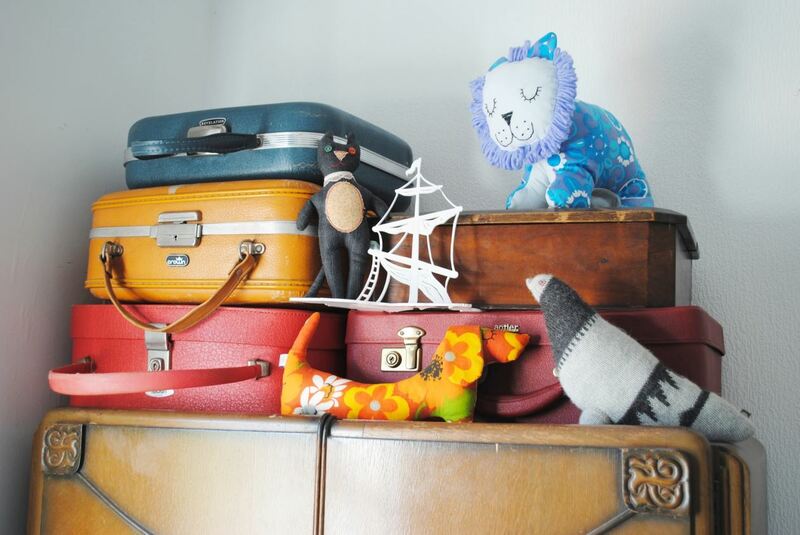 Today we have a look at a really cute boy’s room, adorned with vintage treasure! 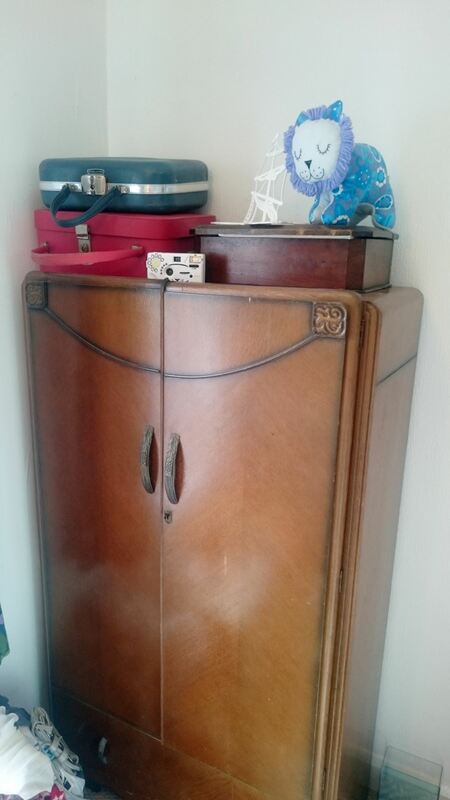 To be honest this could be a girl’s room too and it makes the perfect vintage nursery. 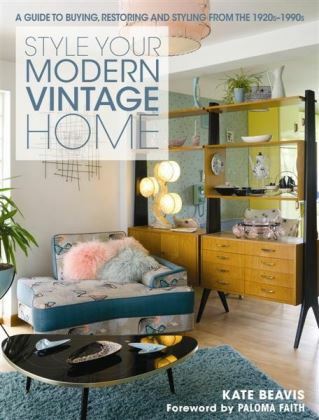 The home belongs to Hayley McPhun from Pigeon Vintage and the room belongs to Stanley. 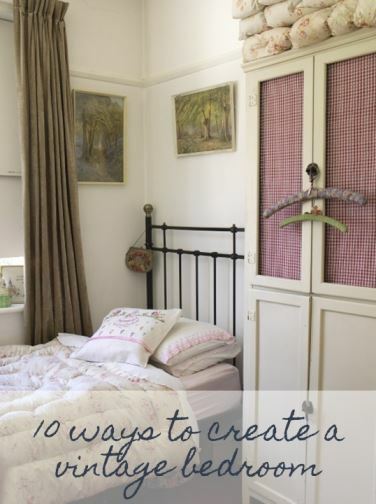 I caught up with Hayley to find out more about this cute room. “Stanley is now one year old. We live in a very tiny village just outside Scunthorpe called East Butterwick. It’s one of those old fashioned villages with no post office, no shop or school and almost everyone knows everyone else. 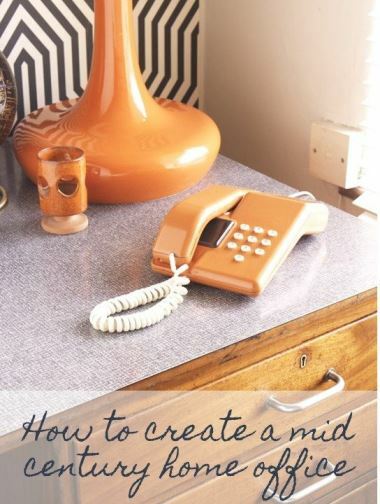 It’s a great place to bring up a family and get to have a snoop around people’s homes that haven’t changed for decades! 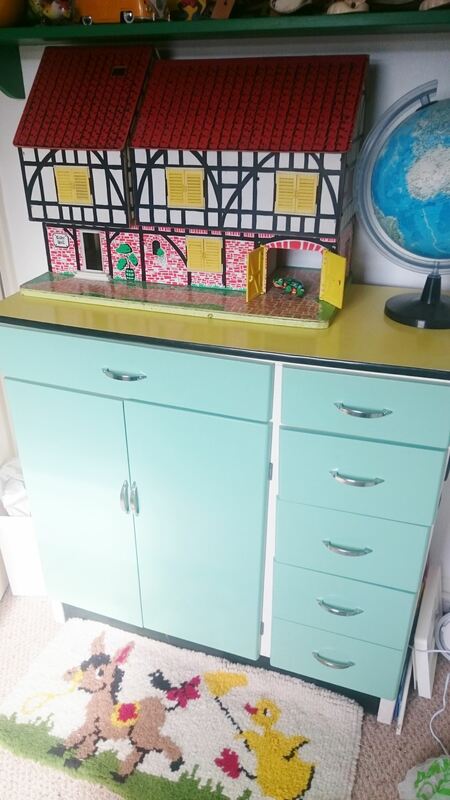 Why did you choose vintage for your son’s room? What are your favourite items in Stanley’s room? 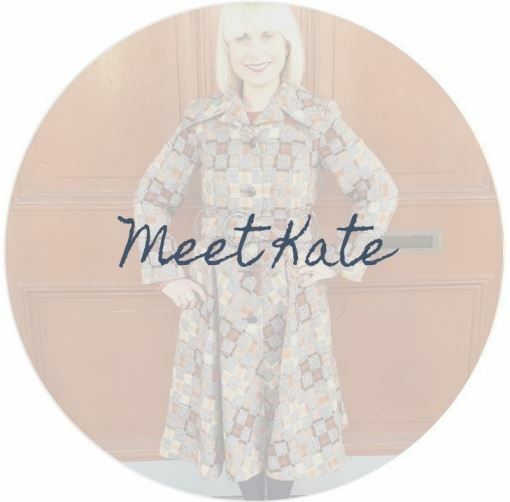 “The curtains in Stanley’s bedroom are one of my favourite items in our whole home, mainly because of how and when we acquired them: on my fourth date with my partner, we decided to go to Hemswell Antiques Centre as a treat and a way to figure out whether our tastes were similar. 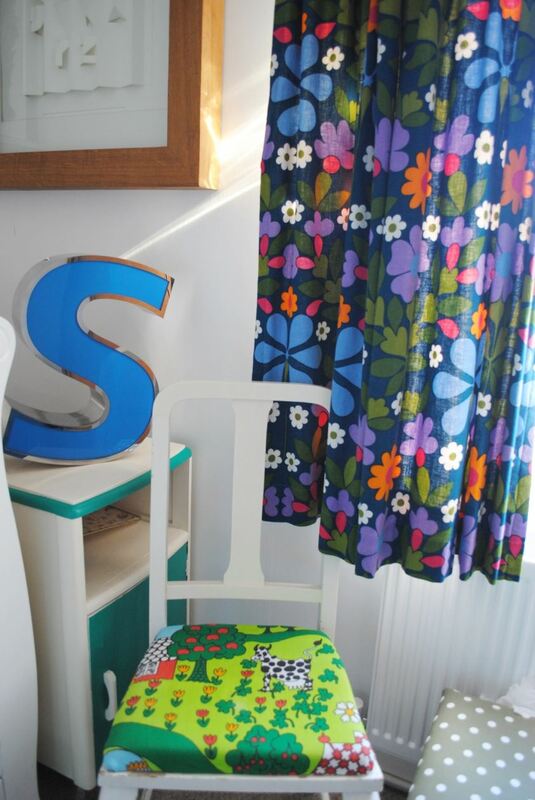 In the first room we walked into, I spotted these curtains and fell in love with the pattern immediately. I said “I don’t know what I’d use them for?” to which my fella said “In a nursery, we could use them in a nursery?”, then we both blushed with embarrassment and didn’t speak for about ten minutes. Bear in mind we hadn’t even held hands at this point! But it was right. 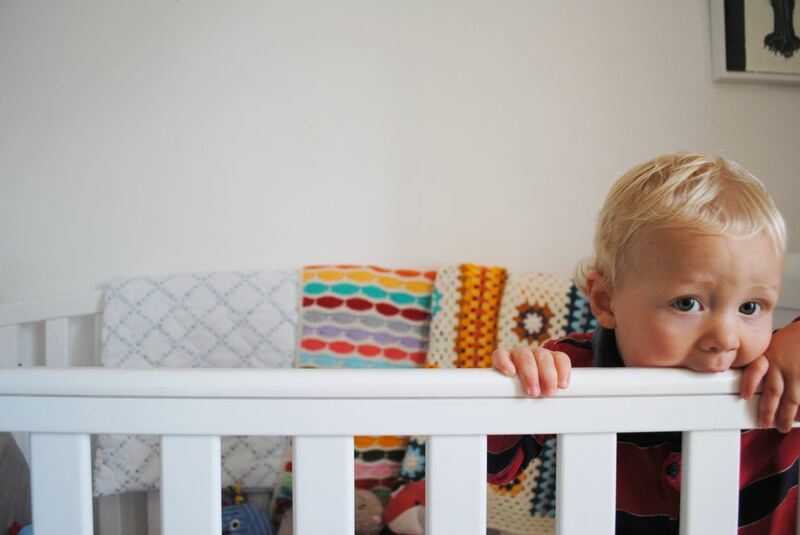 Everything in that exact moment fell into place for both our lives and, yes, they were perfect for the nursery. The Noah’s Arc is one of my favourite toys because I found it on OK Coral’s website when I was off work with dire morning sickness. I couldn’t afford it, so asked my mum if she could get it instead. She never replied, so I forgot about it until it turned up as a glorious surprise present for being pregnant with her first grandchild. WOW! Well they are your favourite items, what about his? “He loves the wobbly yellow duck. 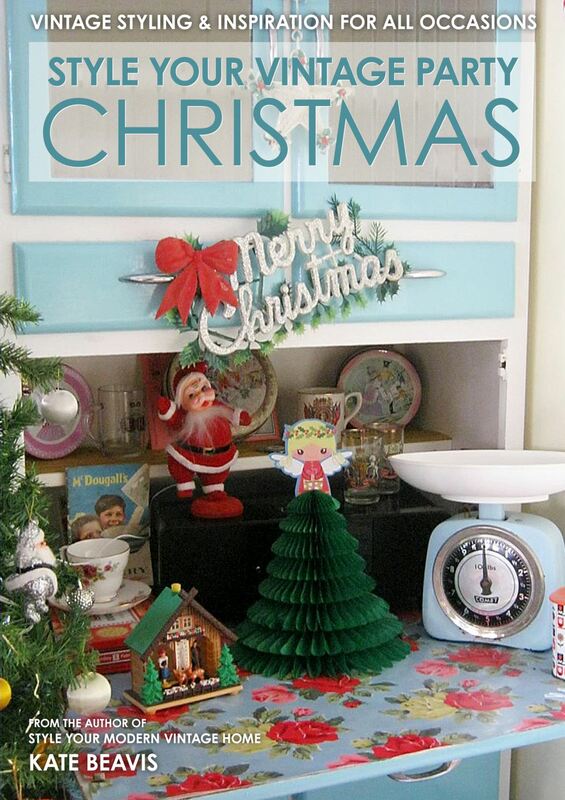 I see now that they’re popular in the kitsch world. This was given to me by my best-friend about 7 years ago. He picked it up from a Polish sandwich shop, Stanley loves knocking it with his feet, though he’s started to get a bit rough so I fear for its condition! Stanley adores the small Kewpie. 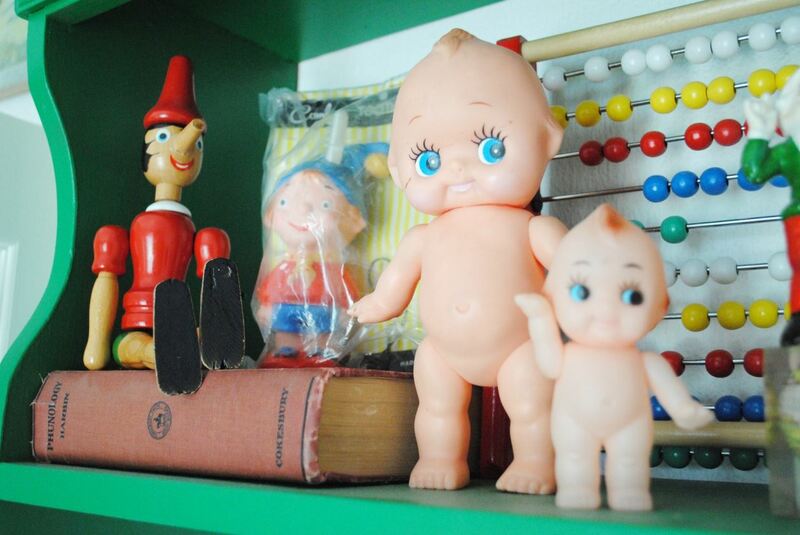 The rest of the vintage world know this famous doll as Kewpie, but my family and friends will always call it Baby Gary, after I found the big doll in a charity shop while at University and thought he was the cutest thing I’d ever seen. From then he travelled around every single home and everyone knew him as my Baby Gary. Snoopy dog is a favourite of Stanley and our dog Rufus, who likes to bark at it. Snoopy was mine and my brother’s growing up and the string broke so often, there are loads of strings ends just hanging off this guy, from various places. He’s well loved, that’s for sure. There’s a cross scratched into Snoopy’s left eye, no-one knows where this has come from. 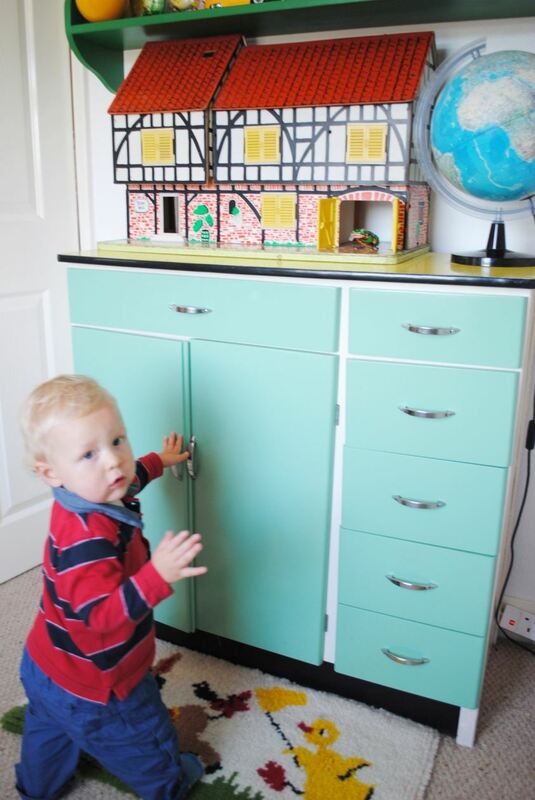 What will you do when he grows up and maybe hates this vintage stuff!! 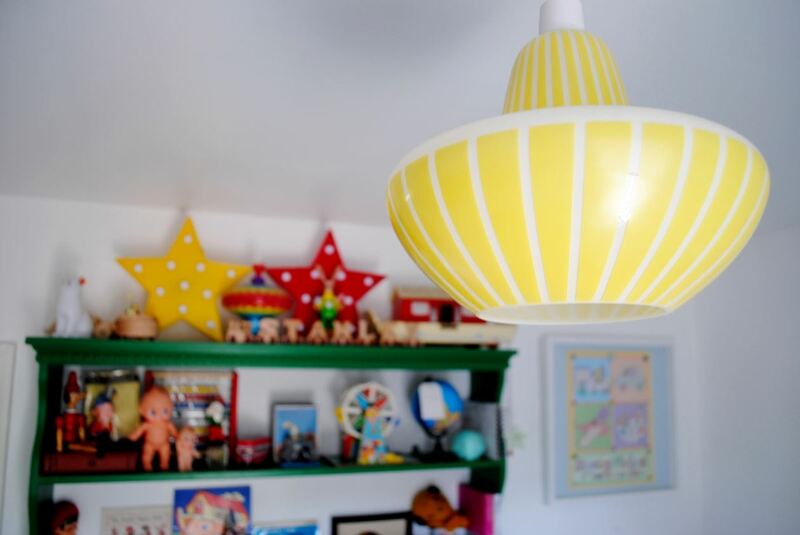 I still can’t quite believe that the gorgeous yellow light shade cost 20p! 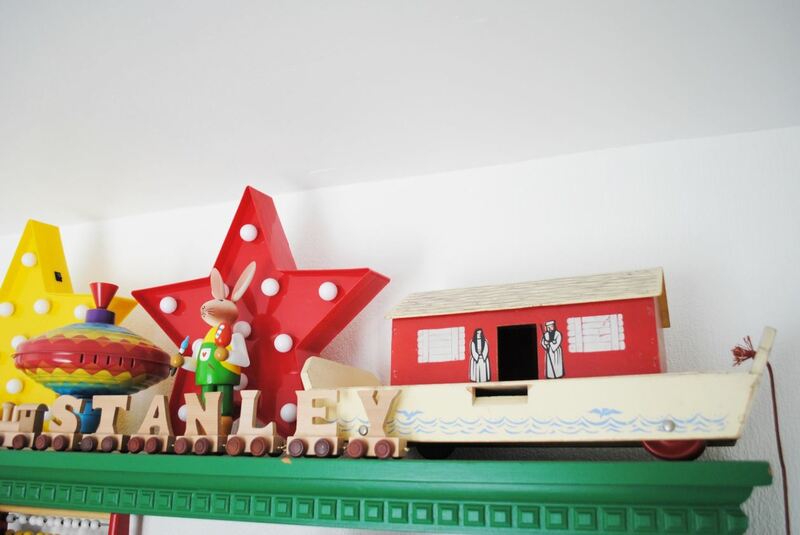 I really love this vintage nursery, it’s bright and fun and filled with toys that have lasted generations rather than modern, expensive toys that won’t even last Stanley’s childhood. 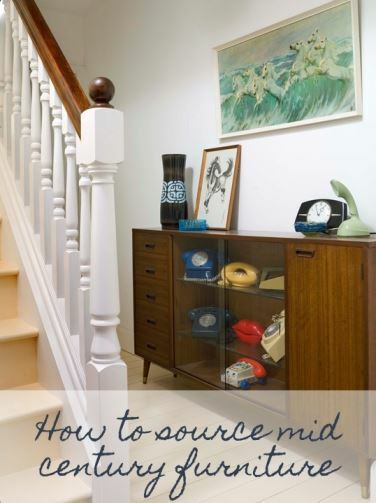 Do you have a room or home filled with vintage that you would like to share? Get in touch! p.s. 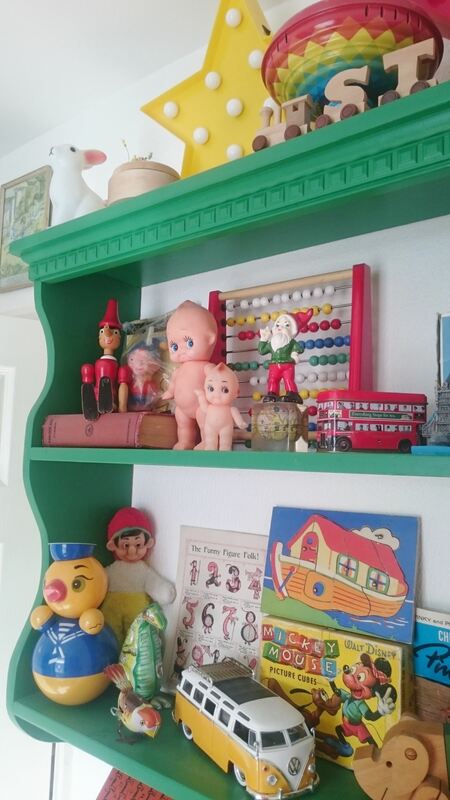 Have you seen our children’s vintage playroom?